It is Monday..I am not a fan of Mondays sooooo every Monday during the Month of October, Breast Cancer Awareness Month, Tall Mom will be hosting Giveaways. The Sponsor of the Giveaway today is i declare! My loves are simple and each is an inspiration to me. My children, my husband, and my running. I love being able to wear personalized jewelry that shows who I am. It is a great way to talk about my children, races I have run, and truths I try to live by. Things that matter most. Because it represents what is most important to you, each charm is made by hand with the utmost attention to detail. These are not mass produced, and every charm is cut, stamped, and polished by me- so each one looks unique. Thanks to Annette and i declare! you all have the opportunity to win a BEAUTIFUL necklace with the words "Live to run run to live." 1st- Go to the i declare charms website HERE and shop around.. FYI Christmas is coming FAST!! Look around and leave me a comment about the website and which items you LIKE. Remember to thank Annette for her generosity is hosting this Giveaway. 1. Become a Follower of the i declare charms! Blog HERE. You WILL want to because often she posts about freebies and sales. Leave a comment. 2. Join the Tall Mom Bloggy Pack (Become a Follower) and let me know in a comment.. Or leave me a comment to get credit for already being a Pack Member. 3. Answer the question: What is on your jewelry Christmas list? Leave a comment. 4. If you could have anything engraved on a Necklace what would it say and why? Leave a comment. 5. Link to this Giveaway on your Blog...or tell others about the Giveaway. Leave a comment. 7. Send me a photo you have taken to be entered into an upcoming Tall Mom Photo Contest, the theme is PINK. Leave a comment to get credit for this Giveaway. 8. Join the Tall Mom Email list...send me an email letting me know that you would like to join. Leave a comment here. 9. Join the Tall Mom Mailing list...Send me an email with your name and address. Leave a Comment here. ***Next up ways to Go Pink for the cause this October and the whole year round. I WANT A RUNNING NECKLACE! hehe that was me speaking loudly :) but i really do!!! i am already a follower which you know. YES that was your card on my bulletin board too... does that get me an extra point :) haha. THanks Annette for hosting the giveaway. Everything on your website is beautiful. 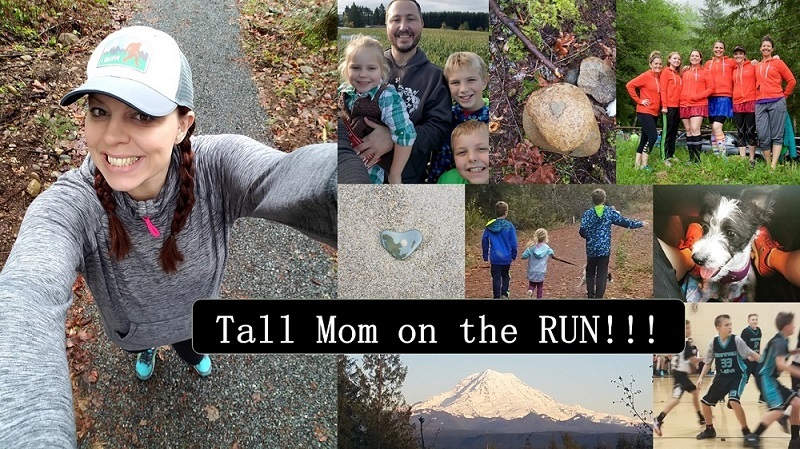 I'm a follower of tall mom on the run! I don;t have anything on my christmas jewerly list yet. My necklace would simply say ENDURE. Checked out the website and became a follower of the ideclare blog. Totally love the Eternity Link Bracelet! Okay - went to the website and I love the NEW Stay put-no slide bracelets - the one with the 13.1 on it would be great since my Half marathon is in December!!! I actually don't have any jewelry on the Christmas list ( we are on a budget) but I would love the stay put - no slide bracelet as a finish line gift!!! I would like a necklace with my boys names on it AND I would love one with my logo and Busy Running Mama!! I tried! Those are hard letters!! I have been eyeballing these necklaces for a while now (saw them in your sidebar)... My sister and I are just starting our Half Marathon training (our 1st!!) and I have plans to get us the 13.1 necklaces for her and I when we finish!! This is an awesome giveaway- Thank you!! my jewelry christmas list WAS a Garmin 305 but since I ordered that the other day, these ideclare necklaces will fill that spot! I love the "believe" stay put-no slide bracelet. Annette's things are beautiful! I'm already a pack member. The jewelry on my Christmas list: the Pandora running shoe charm for my Pandora bracelet! #4: I'd put "Love the life you live" on a neckace! i'm in the tall mom bloggy pack!!! woo woo! i had trouble getting the websites to work! i think it might be my home computer? (way old laptop from college!) -- i am going to do all the entries tomorrow. Oooo! I like the square charm necklace. What an awesome giveaway! Thanks ladies! I like the charm bracelet because I could put all of the things I love together. Anybody that knows me, knows I LITERALLY RUN TO LIVE. History shows, I don't get my endorphins through exercise, I relapse into my addiction. I relapse into my addiction on more time, I will probably die. On a lighter note........ great stuff! This stuff is beautiful! Thanks Annette AND Mel for hosting this wonderful giveaway. Already a Tall Mom bloggy pack member OF COURSE! My Christmas jewelry list: a diamond solitarie would be nice. ;) J/K... I would really love one of the mini charm necklaces! If I could have anything engraved... agh, too hard to choose. I like "Pride is permanent" or "Believe in 42.2"
I linked your giveaway on today's post. okay i am back. the links still don't work but i just found the website through google. This incredible bracelet can be worn all the time as it will not slip and slide up your arm. With the "stay put" nature of this bracelet, you can even wear it running without it bugging you! a bracelet you can run in??? sign me up! i am skeptical but def want to try it. plus it is beautiful and i love the words, so i would obviously wear it not-running as well. i am at the blog, but darn it missed the sale!! :) was only thru oct 11. i can't find the "follow" option?!?!?! how do i follow them?????? does my effort count?????????? i just see "click here to order" or "create your own personalized necklace today" links. my xmas list: now that i have 3 new necklaces, i want a bracelet ! just like the stay put "run happy" one i posted above about. actually... if i didn't get run happy i would want "believe" written on my bracelet. or "believe in the run" or "stay strong" or "RUN HARD"
i tweeted/blogged about the giveaway!!!! okay i am officially "fully" entered :) wahooooo. I just emailed you to be added to your email list... and thanks very much for the comment on my blog and your speedwork recomendation, I appreciate it!! Hi! I love your giveaways! I actually really love the necklace you pictured....run to live and live to run....this is WHY I run! I am already a follower~! As for my jewelry wish list....well, now a necklace from I declare! I found a ring I love and I ended up buying it because it was on sale....I thought I would have my mom give it to me for x-mas but it came quickly and I couldn't pass up wearing it now! The only thing on my jewelry list this year is a running necklace! Fingers crossed! Sent you an email for mailing list. I like the stay put bracelets. Thanks Annette! Love the Run Happy bracelet! There is something funky w/the link to their site, btw. I had to cut out the blogger address at the beginning to get to the site. The Runner Girl charm is so cute! I am also looking for the perfect thing to commemorate my first marathon, so I love the 26.2 charms too! I am a Tall Mom follower, of course!! I couldn't follow the link but I found their website on my own! I LOVE LOVE these necklaces! I found one to get for a friend of mine. She just lost over 100lbs. and is running a 1/2 marathon in a few weeks. This would be a great gift for her....and a good giveaway to win!!! Thanks annette for hosting such an awesome giveaway! Eveything is so cute, but I have to say I think the believe bracelt is cute. And it has a powerful message too! On my jewlery christmas list I would love to get a new necklace or two, and maybe a new charm for my charm bracelet that my mom bought me for my birthday this year! If I decided to order one of these necklaces I think I would just get my name on a big one... Michal is not a common name I actually have never met another person with it. Plus ive never gotten to have anything cute with my name on it. I would also get a mini charm to go with it saying "xoxo"
First entry ... I like that they have all of the navigation options at the top of the page, including testimonials! It's always difficult to know if you want to shop online, not having used a shop before. That said, I love the Eternity Link Bracelet! On my jewelry Christmas list ... a delicate cross pendant/necklace and a mom charm bracelet. If I could have anything engraved on a necklace, it would probably be just one word: Blessed. I often am caught up in all the ways I wish my life were better, easier, etc., and I need to take time to look at all the things I have to be thankful for. I love the necklaces on the website! I would love a 26.2 charm necklace. Thanks for hosting a cool contest! I am a follower who loves this blog! Jewelry wish list for Christmas: a 26.2 charm necklace....Are you sending out the links to our hubbies? Sent you my photo. Look at me with all my entries. I would have mine say "I Love Running" or "Lazy Bones Runner". I'd probably go with the Lazy bones runner. hee hee... I live in Central KY.... but this works. I am going to blog today... I will link this giveaway. I love the fact that you can personalize anything you want on her necklaces! I would so love to win this. As a beginning runner I'm always looking for more motivation. My jewelry christmas list includes new silver (or white gold preferably) oversized hoops. Mine are getting kind of beat up. I want one of the charm bracelets! But all of it is cute! I am already a follower of Tall Mom. I just became a follower of i declare charms! I want the eternity link bracelet. I'm now following Tall Mom on the Run. The author of www.tallmomontherun.com has written an excellent article. You have made your point and there is not much to argue about. It is like the following universal truth that you can not argue with: No one knows the origins of their metal coat hangers. Thanks for the info.